Supertech Valves - PURE Tuning Inc.
Supertech uses over 20 years of manufacturing experience to design and produce their Valves. Intensive testing and working closely with engine builders provides continuous improvements and provides the market with the best possible product for every application. High flow rate, durability and quality are all of great concern. Supertech understands that each motor is unique in its requirement and demands. There fore Supertech offers valves in a range of materials to suit any motor. Stainless – Made as a one piece forged valve for higher strength and reliability. 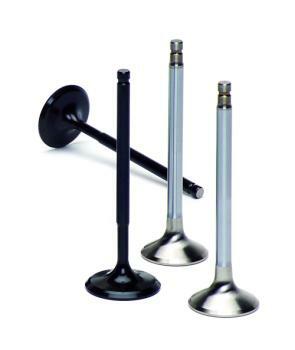 Supertech uses mostly EV8 (21-4N) for Intake and Exhaust Valves, however there are other alloys that are used with different heat treatments to manufacture Valves for specific applications. Black Nitride – This is a hardening treatment that provides a smooth surface then chromed valves and produces less friction between stem and guide. Inconel 751 – Nickel Base Alloy – Nickel base alloy is used for exhaust valves that reach very high temperatures, such as those in turbo or supercharged applications. © 2019 PURE Tuning Inc.